The instance of female feticide is on the rise and to put a stopper to the situation, the state government of Rajasthan has started the program called the Mukhya Mantri Rajshree Yojana. Under this scheme, the state will assist the families in educating and providing a better future for the girl children by providing financial assistance. 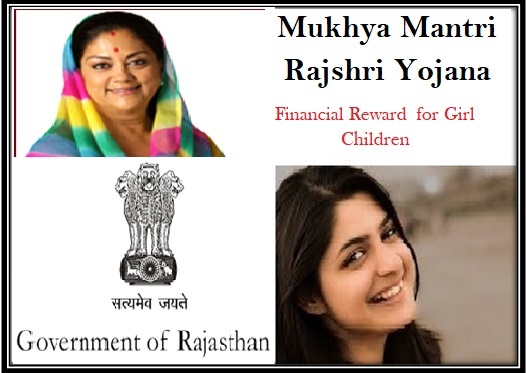 Financial assistance for the female candidates – The Rajasthan government will assist the families of the female children financially for providing them with good education and secure future. The benefits will be given to those girls, who were born on/after 1st June 16. The government will provide a sum of Rs. 50,000 to each girl. Payment will be made in installments – As per the draft, it is clear that the government wants to ensure that the families use the financial aid in bettering the foundation of the female children. For this, the sum of money will be provided in installments. Born and studying in the state – To ensure that the benefit directly goes to the girls of Rajasthan, it has been mentioned in the scheme draft that only those female candidates will be offered the assistance who are born in the state and are acquiring education in the public schools, located within the state boundaries. For female candidates only – Keeping in line with the name of the scheme, its guidelines highlight that only female candidates will be able to enroll under the scheme and get the financial benefits to secure good education. Birth date criteria – It has been mentioned in the draft of the scheme that only those parents will be able to get the names of their female children registered under the program who were born either on or after the specified date of 1st of June. Applicable for residents of the state – This scheme has been designed especially for the girls born and residing in the state of Rajasthan. Any girl who has not been born in the state will not be allowed to take part in the scheme. Aadhar and Bhamashah card –The applicant will have to produce the Aadhar card of the child. The applicants will also have to attach a photocopy of the Bhamashah card, provided by the state government. Proof of residence – As the program has been announced for the girl children born and living in the state alone, the applicants will have to attach any document that will support the residential claims. Certificate of birth – Due to date specification in the scheme; the applicants will have to attach a copy of the birth certificate of the girl to prove that she was born on/after 1st June, 2016. Details of the bank account – Cash transfer is limited only during the time of birth of the female child. Thus, it is mandatory for the applicant to have an active bank account and the details must be provided. Photograph of the female child – Last but not the least; the application form must have passport sized photographs of the female child who is the actual beneficiary. The government has kept the traditional offline process of application open. The application form can also be acquired from the office of the Collector of the Zilla Parishad. The office of the health officer or the Gram Panchayat or the education office will also provide the application form. The office of the health inspector, on the Taluka or district level will provide the application from. Once the parents have collected the application form from any of the sources mentioned above, they will have to fill it up carefully so that all details are mentioned without any errors. The second point is attaching the required documents with the application form. These papers will assist the government authorities in making the verifications. Based on these verifications, beneficiaries will be selected. After all these things have been done, the parents will have to submit the application form at the office of the Gram Panchayat, Zila Parishad, health officers, education officers or the high authorities at the district or Taluka level. The state government has promised to provide necessary funds for the successful implementation of the yojana. According to the Rajasthan State Budget for the year 2016 – 2017, a whopping amount of Rs. 99,693 has been allotted for the proper operation of the program. The Indian community does not give same importance to male and female offspring. The condition is all the more bleak in rural settings. Female infanticide has gone down, thanks to central and state initiatives. National Health Mission aims at safeguarding the health, and wellbeing of girls. Recently, the third phase of “Daughters Are Precious” scheme was implemented in Rajasthan. On this occasion, a special power point presentation, with sound effects, was organized that highlighted the sorrow of girls. This presentation was successful in stirring up emotions in people as 5000 individuals came forward with the pledge to take a firm step to stop female child death.